U.S. now committed to protecting the unborn at the U.N.
CNA—As negotiations begin on the annual United Nations humanitarian assistance omnibus resolution, the United States will remain committed to protecting the fundamental right to life for the unborn, a spokesperson for U.S. Ambassador Nikki Haley told CNA. Included among the United Nations’ definition of “reproductive health-care services” are the promotion of safe abortions and access to contraceptives, which sit alongside treatment of sexually transmitted diseases, access to pre- and post-natal care, and the prevention of female genital mutilation. These resolutions are not binding in international law, but do reflect internal United Nations priorities and policies. The repeated inclusion of “sexual and reproductive health” in resolutions could result, over a period of time, in the United Nations adopting abortion as a human right. When reached for comment, Haley’s press officer Andrea Stanford declined to comment on specific actions that the ambassador may take regarding the language of the resolution, citing the recent start of negotiations. Stanford said that the United States would be “committed to advancing policies that protect the lives of the unborn,” in “all multilateral forums, including the United Nations” in which it is a member. Haley, who served as United Nations ambassador since the beginning of the Trump presidency, announced in October that she will be stepping down from her position at the end of this year. During her resignation announcement, she denied rumors that she was considering a presidential run. 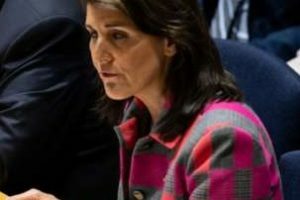 President Trump praised the ambassador’s service, and said Haley was welcome back in his administration at any time.